A recent Gallup poll shows that when asked, Americans divulged that their top environmental concern is pollution of drinking water – an understandable concern. So, where did global warming rank? Let’s dive a little deeper into the study and find out. Nonetheless, respondents were given three choices when answering questions asked. Optional responses were great deal, fair amount, and only a little/not at all. 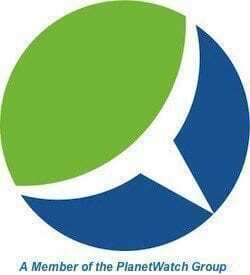 Of greatest concern are water related issues; pollution of drinking water, pollution of rivers, lakes and reservoirs, contamination of soil and water by toxic waste, and maintenance of the nations supply of fresh water for household needs. Gallup has conducted this same survey, and have been monitoring annual results since 2000. 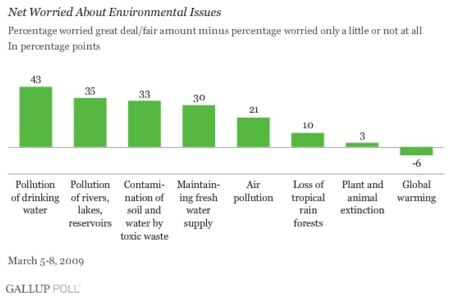 The first year of the survey, 66% of respondents said that they worried a great deal about pollution of rivers, lakes and reservoirs. Just four short years later, that number had dropped 18 percentage points to 48%. Fast forward to this years survey and that number is up only 4% (52%). The following two line charts show the variation in responses from 2000 to 2009. 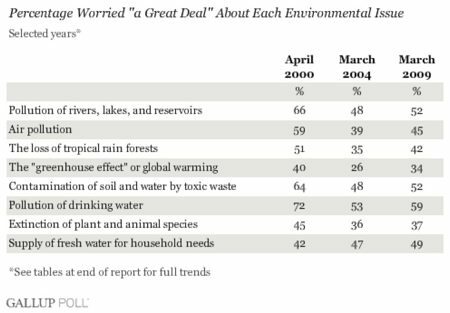 According to Gallup, “Since 2004, public concern about the eight environmental matters rated this year has either been stable, or risen. 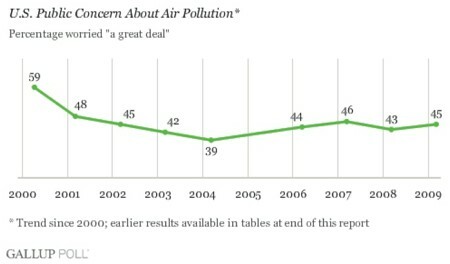 The largest increase in concern is seen with global warming. Despite remaining at the bottom of the list of expressed concerns, the issue has nevertheless seen an eight-point increase in the last five years. 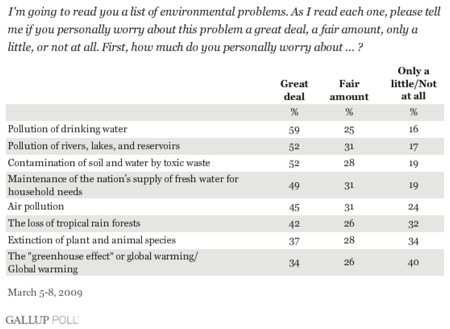 There has been a similar seven-point increase in concern about the loss of tropical rain forests over that time.” The following chart breaks down the percentage of respondents answering they are worried a “great deal” about various environmental issues – taken from 2000, 2004 and 2009’s Gallup survey. So, I ask you, how would you have answered these questions? Do you agree with the findings? Do you feel the survey is missing something? What’s your interpretation of the results? Environmental pollution problems concern varies with a person’s exposure. 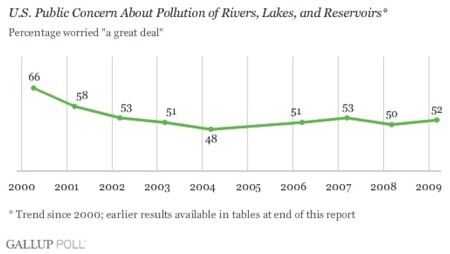 While American ranks water pollution problem as a major problem because quality of drinking-water and that of rivers concerns them significantly. A person in drought-prone area will term land degradation as major problem. Top soil washout and landslides would be a major concern for people living in Indonesia and Phillipines, acid rain for people living in Europe, and air pollution for people living in Karachi. A person working in UNEP or ADB would rank climate change as a major problem. The bottom line is: a person’s perspective and exposure to the environmental pollution, determines his/her priority. Thus, ranking differs from one area to another. I live in an area with terrible drinking water. Massive amounts of arsenic. That impact on my children is my biggest concern.